A Shared Confidence by William Topek, a Mysterious Review. Review: Kansas City PI Devlin Caine receives a telegram from Baltimore, where his brother, Nathan, asks for his help in conning a con man in A Shared Confidence, the second mystery in this series by William Topek. Nathan Caine works as Vice President in charge of Small Business Loans at a very old, very conservative bank, Bedlam and Morrissey Bankers of Baltimore, est. 1837. When Nathan was doing his end of the month read-throughs, he found the amount of $140,000 had been loaned out to three small businesses. The problem? None of these businesses actually exist. Whoever in the bank did this has set Nathan up to take the fall by forging Nathan's signature on all three bogus loans. Devlin, a former employee of Pinkerton Security, knows a thing or two about cons, and agrees to help Nathan. He brings along a friend, Clay Stanton, who also happens to be a professional con man, and together they devise a plan to get the money back and expose the men, who embezzled the bank's money and framed Nathan Caine. It takes a bit of a road map to keep track of the assumed identities taken on by the characters — government agents and gangsters make an appearance as well — but the journey here is most certainly worth the effort. This is a delightful mystery, with authentic period details providing a colorful backdrop to the clever schemes being played by the good guys against the bad guys. 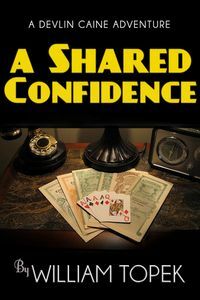 A Shared Confidence will appeal to those readers who enjoy twist-filled crime caper-style novels, especially those that have a historical setting. Special thanks to guest reviewer Betty of The Betz Review for contributing her review of A Shared Confidence. Acknowledgment: the author provided a copy of A Shared Confidence for this review. Location(s) referenced in A Shared Confidence: Baltimore, Maryland.